Thanks to the celebration of Cinco de Mayo, it’s no surprise that the sale of tequila begins to rise at the beginning of May. As tequila has become the national liquor of Mexico and the foundation of the holiday’s signature cocktail, the spirit has become synonymous with May itself. But we think there’s another Mexican spirit that, while recently gaining popularly, has yet to achieve the same kind of acclaim that it deserves, and that’s mezcal. Tequila’s agave-based cousin — once linked to the idea of a gimmicky bottle with a worm at the bottom — has been on the rapid rise, doubling in sales over the last four years. Though it’s become one of the fastest-growing spirits in the United States, due to the availability of higher-quality brands, it can still only stake claim to a small amount of the market. As we feel it’s our duty to support the spirits that are underappreciated, our May Cocktail of the Month features not tequila but smoky mezcal. In honor of Cinco de Mayo, we pulled a recipe that boasts many of the same sweet and sour flavors of a margarita, but has an extra pungent kick. Thanks to biting mezcal, ginger syrup, and chipotle pepper, the Barbacoa is not for those who love the cloying nature of a margarita made with pre-bottled mix. 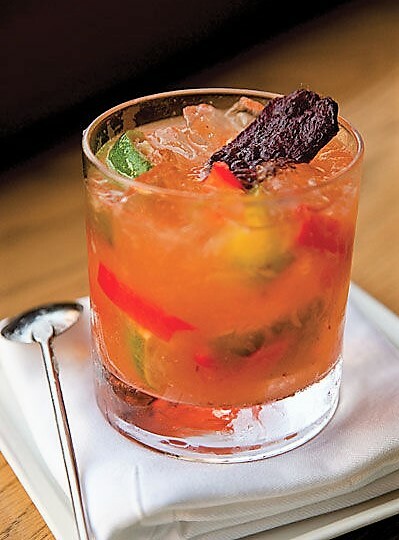 In fact, with the addition of bell pepper and a beef jerky garnish, this smoky, spicy, earthy, and salty libation is ideal for those who are after a more balanced drink — one where savory meets sweet in perfect harmony. Pro tip: For the ginger syrup, we recommend this kind by Pink House Alchemy, or you can make your own. Simply combine 1 cup sugar and 1 cup water into a small saucepan over medium-high heat, stirring until the sugar dissolves. Add 1 piece (about 10 inches long) of freshly peeled ginger cut into very thin rounds. Bring the mixture to a simmer and then remove from the heat, letting it steep for about 30 minutes. Once cooled, strain the syrup and discard the ginger. The mixture can be kept in an airtight container in the fridge for up to a month.